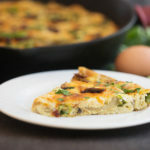 Spice up your daily eggs and take breakfast to a whole new level with this crustless quiche. It is easy to prepare, great for meal prep, and will help fuel your entire morning. Traditional quiches are typically filled with carbohydrates that can kick you out of ketosis, but this crustless (read: low carb!) version is just as rich and delicious. Another bonus to making quiche is they refrigerate and reheat remarkably well, so they make a wonderful option for meal prep at the beginning of the week. Many people do not realize they have a sensitivity to cow products like milk and cheese until they remove it from their diet. If you have suspected you are lactose intolerant and do not properly digest milk proteins, goat cheese could be a great option for you to try. Some will say it’s very strong when eaten on its own, but incorporating it in smaller amounts in recipes like this could help you transition over to a more dairy-free diet and help determine if you truly do have an intolerance to cow’s milk. Goat cheese is actually extremely beneficial to our gut health. Many cheeses contain probiotics that help improve the lining of our stomachs which help boost immunity and reduce the amount of inflammatory actions in your body. Probiotics found in cheese help feed the gut lining a variety of bacteria which help improve digestion, increase the amount of nutrients you absorb, and help fight infection. One of the problems with cow’s milk is it contains common allergens such as lactose and A1 casein. Goat milk only contains A2 casein which means it will be more gentle on the stomach and will not produce the same inflammatory response as cow’s milk. The chemical composition of goat milk is also the closest to human breast milk. Most people think that cow’s milk is the best source for calcium, however goat’s milk actually contains more of this specific mineral. Calcium is vital in your body because it helps build and maintain strong bones, keeps your heart, muscles, and nerves working properly, and can even help protect you from cardiovascular disease. In addition to calcium, goat cheese is also rich in Vitamin A, Vitamin B, copper, and phosphorus, which are needed for a wide variety of processes in your body. If you have suspected an intolerance to cow’s milk, goat cheese could be the replacement you have been looking for. It’s rich, tangy, and full of flavor. Goat cheese is just as easy to incorporate into recipes and you may be surprised at how much more you enjoy it. Adding some to this quiche recipe is a great way to introduce yourself to goat cheese. Preheat oven to 350 degrees and grease a pie dish with butter. Combine eggs, heavy cream, coconut milk, salt, pepper, parmesan cheese, and coconut flour in a large bowl. Mix well until smooth. Set aside. Heat a large skillet under medium heat. Add olive oil, onions, mushrooms, sun dried tomatoes and asparagus. Cook for 3-4 minutes until slightly tender. Remove from heat and let cool. Stir vegetables and goat cheese into egg mixture. Pour contents into prepared baking dish. Top with mozzarella cheese.